Ziad Mohamed Saleh Bakir left his home on 28 January, on the 4th day of the Revolution, and never returned. For the next 44 days, his family kept searching for him, hoping to find him alive. During all those weeks, the family contacted practically all the Egyptian and international media, to help them in their search, reached all crucial institutions and officials asking for support, and searched every hospital and mortuary. There was no trace of Ziad. The family also visited the Zenhom mortuary in Cairo many times. On 10 March, the discovery of Tarek Abdel Latif’s body, one of the martyrs of the revolution, gave a sad turn to Ziad’s story. “During the weeks searching for Tarek and Ziad, we became closer as families. Tarek’s wife called us on 9 March saying that she has found her husband in Zenhom. Unfortunately he was dead, he had died as a martyr,” Mirette Bakir, Ziad’s sister told Ahram Online. Tarek was one of the martyrs whose family had visited the mortuary several times. On 9 March his body was finally located – “with the wrong name-tag, in spite of the fact that Tarek had his identification card in his pocket,” Mirette added. “So we decided to check once again”. On 10 March on another visit to the mortuary, Ziad’s body was finally discovered among unidentified people, with documents stating that the body was delivered on 3 February. Understandably, for the family, finding Ziad’s body was a tremendous shock, mixed at first with denial. In spite of the fact they were sure that it was Ziad’s body (supported by some marks), the family asked for additional DNA tests, and the results received on 12 March proved what they already knew. Despite all those question marks, the family has found closure, but their investigations will continue. There are filing a number of cases which should provide the answers to the many questions still unanswered and lead to justice for a lost soul. We know that Ziad Bakir, one of the martyrs of the 25 January Revolution, died either on 28 January or shortly after. His funeral took place on Sunday 13 March and a huge number of people gathered there who knew Bakir, as well as enormous crowds of pro-democratic supporters. 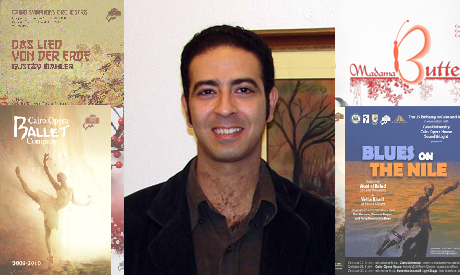 Ziad Mohamed Saleh Bakir was born on 9 November 1973 and graduated from the Faculty of Fine Arts, Helwan University (Zamalek, Cairo) obtaining a BA in Interior Design in 1995. In 1997, he started working on his Master’s degree on "Neo-realism Cinema in Egypt (1982- ) Visual Concept". His professional experience includes work as a stage designer and an interior and graphic designer. For the last few years, he was best known for his remarkable work in the Design Office of the Cairo Opera House, where he was supervising a team of graphic designers, working on all printed material related to the opera. Bakir inherited his interest in art from his parents. His mother, Sawsan Fouad is an interior designer. His father Mohamed Saleh Bakir, who used to work as a diplomat and the first deputy to a minister, considers caricature art as his main hobby and many of his caricatures have been published in Egyptian magazines. Daily life in the Bakir’s family incorporates many intellectual elements. Ziad spoke fluent Arabic, French and English, and could hold simple conversations in Spanish and German. “Our father worked as a diplomat in Germany for some time and this is where Ziad picked up some German,” Mirette explains. Coming from an intellectual home, where shelves bend under the weight of thousands of books, Bakir was raised surrounded by the most refined art forms. Classical music has been one of the integral parts of his family life. Working on designs at Cairo Opera House became a passion for Bakir. He developed warm contacts with many musicians and music specialists. “Ziad would listen to CDs with classical music in the office,” Karam Saad recalls. Bakir was often reacting to many compositions when preparing a poster for a concert, opera or ballet. He would also talk to music professionals and listen to their stories about music. Nayer Nagui, a composer and conductor at the Cairo Opera House shared another example of Bakir’s work on the Mozart’s Requiem poster. “We would talk a lot about the music, and he would listen to the music… The design he then created would carry elements from beyond creativity. It was very symbolic, elaborative and it would always make you think,” Nagui said. Only a few months ago, Bakir finished working on the Cairo Opera Ballet Company book. Erminia Kamel, the artistic director of the company remembers the months she spent at the design offices. “He was a very skillful artist. I admired his choices and solutions given to the whole production process,” Kamel commented. Sherif Sonbol, a photographer who was often cooperating with Bakir providing pictures for many designs, sees that Bakir’s designs for opera performances were especially outstanding. “There is a lot of art and personal vision in those designs,” Sonbol commented. Mona Rafla, a soprano and Cairo Opera Company executive, values Bakir’s sensitivity and artistic touch especially stressing Bakir’s “unforgettable design” for Puccini’s Madama Butterfly. “We worked together for three years. Ziad was always surprising me with the beauty and delicacy of his designs,” Rafla evokes the days they used to spend when preparing for an operatic event. There is an evident artistic progression in the designs of Ziad Bakir. The most mature and professionally- refined designs come from the last three to four years of his life. This is possibly when he defined himself as an artist and was the time when he was preparing for his first exhibition. Between 9 and 15 October 2010, Bakir held his first solo exhibition. His best works were presented at the entrance hall of the Cairo Opera House. It was also the first poster exhibition of an Egyptian artist in Cairo. Bakir was extremely happy and was looking forward to more presentations of his art. Hopefully the Cairo Opera House management will consider holding another exhibition soon, in memory of all that Bakir has given to the opera. Bakir was always helping his friends and colleagues and long conversations with them revealed the great vacuum in their daily activities at the office. The comments of Bakir’s colleagues are filled with appreciation and thankfulness for the years they spent with him. The words “exceptional, humble, creative” are also repeated by graphic designers Khaled Abdou and Reham Soheil. It is possible that Bakir’s serenity was viewed as distance. Gabr considers that to people who did not know Bakir well, this calmness could give the impression of being bored or uninspired. “In fact, he was listening, thinking, adding a few words, then creating amazing work in a very short time,” Gabr explained. This was topped with Bakir’s punctuality in delivering his work – “something that was very strange at the Cairo Opera, which does not necessarily value punctuality,” added Nagui. Bakir lived a very dynamic life. He didn’t waste a minute. His colleagues recall football games they played together, during which Bakir would grab a camera and take a few pictures. Photography was another of Bakir’s interests and the camera accompanied him during his trips to the desert. “He was a desert fox,” as Mirette describes him. Exceptional people crossing our life paths do not happen often. Bakir had left an equal impact on children. Not only was he father to three children, “he also used to play with all children he met. He loved them and knew how to talk to them, develop link, entertain them,” Mirette added. Anyone knowing Ziad Bakir for years or even for a few minutes, considers himself lucky to have touched his world. To Bakir’s family, friends, coworkers, colleagues, to the followers of his art, the loss is beyond description and comprehension. “Ziad left home wearing new clothes he bought a day earlier. He left to heavens wearing them,” Mirette added. As Michael Ghali mentioned “death is very selective,” and in case of artist Ziad Bakir the choice was extremely harsh and painful not only for the martyr’s relatives but equally for the world of art. Bakir is one of the examples of precious Egyptian youth who lost their lives for the bigger cause. And even though Bakir was not in any way involved in any opposition or political movement, he gave his life to the new Egypt. His designs serve as an eternal testimony of a great artist. Ati, thank you so much for your heartfelt article. Thank you for keeping the memory of our martyrs alive. albaqaa lellah to Bakir and all our brave martyrs. Your reach-out to those who knew him is powerful in giving a graphic image of our Ziad. There must be more to our Ziad, his three children, his mother and father. The full image will take time, to crystallize our Ziad, an Egyptian unbearably loved martyr of freedom. How wonderful to know more about Ziad Bakir, even it's to harsh to lose talented artist like him. God bless his soul. Thanks a lot Ati Metwaly for sharing us your beautiful article .